Do you need extra help for EL students? Try the Compare Visuals for Equal Fractions pre-lesson. Students will be able to find equivalent fractions using number lines and bar models. Hook students with a scenario. Imagine that you're at a birthday party and your favorite cake is being served. Would you rather have 2/10 of the cake or 1/5 of the cake? Have students discuss the scenario with a partner. Call on a student to share and justify their answer (i.e., 2/10 and 1/5 are equivalent fractions, so you would be getting the same amount of cake either way). Show students a visual. Draw two circle models or fill in fraction circles to display a model of each fraction (see related media). Explain that the two fractions are equivalent, or equal, because they both represent the same amount of cake. Explain: there are many ways to draw models of fractions. Circle models are common, but they aren't always easy to draw. Today we are going to explore two different ways to draw equivalent fractions. Allow students to use their home language (L1) or new language (L2) in their discussions. Have them explain in partners which fraction of the cake they would like to have. Tell students that drawing number lines is one way they can draw a model of equivalent fractions (see related media for example number lines). Draw and label a number line that is divided into fourths. Place a dot on the 1/4 mark. Directly below the number line, draw and label a second matching number line, ensuring that zero and one are aligned. Divide the second number line into eighths, ensuring that the marks are aligned appropriately with the above number line. Ask students to look at the number lines to identify a fraction that is equivalent to 1/4. 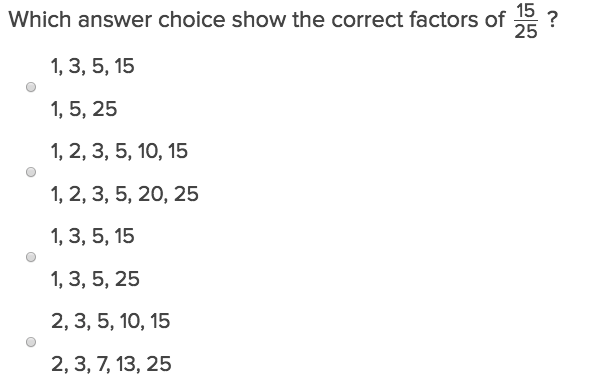 Have students justify their answers, or provide a justification (i.e., "I can tell that 2/8 is equivalent to 1/4 because both fractions are the same distance from zero."). Place a dot on the 2/8 mark. Use a highlighter to emphasize the distance from zero on each number line. Tell students that bar models are another way to show equivalent fractions (see related media for example bar models). Draw a rectangle and divide it into fourths. Label each section 1/4. Shade in one section (1/4). Directly below the first bar model, draw a second matching rectangle and divide it into eighths, ensuring that the half and quarter marks are aligned with the first bar model. Label each section 1/8. Shade in two sections (2/8). 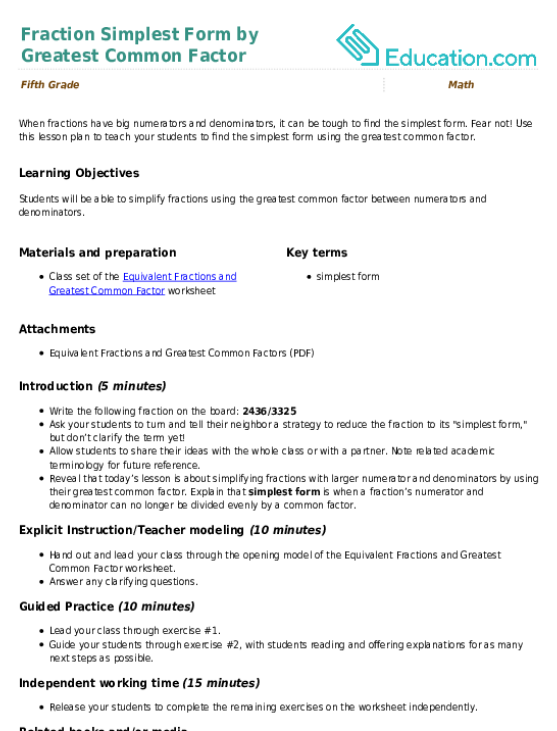 Provide the reference materials in their L1 to look up new terms. 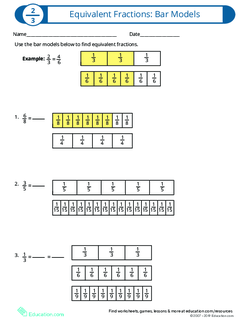 Have ELs restate the method for drawing equivalent fractions on bar models or number lines. 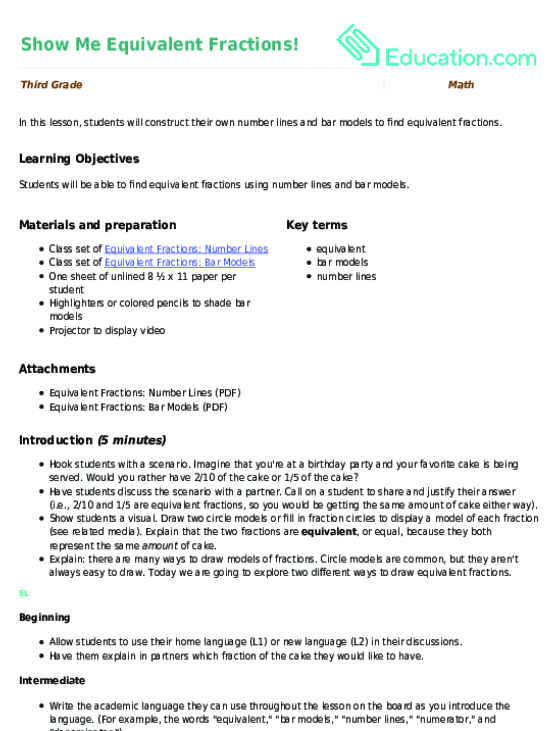 Hand out the Equivalent Fractions: Number Lines and Equivalent Fractions: Bar Models worksheets. Review the sample problems on each worksheet. Have students work with a partner to complete the worksheets. Circulate the room as students work and provide support as needed. When students are finished, review the worksheets as a class. Have students work with sympathetic partners that can understand their L1. Encourage them to use the vocabulary cards for assistance in their discussions with their partners. Have ELs restate key information students shared during their explanations while completing the worksheets. Hand out a sheet of 8½ x 11 paper to each student. Have students count off 1–6. Assign each number a different problem (i.e., if you are a number one, draw number lines and bar models to show a fraction that is equivalent to 3/4). Write each problem on the board for student reference. Have students construct their own number lines on one side of their paper and bar models on the other side to show equivalent fractions. Organize a jigsaw review: group students according to which number problem they modeled and have them share their number lines and bar models as a group (e.g., students who modeled problem one would check their work with other "ones"). Instruct students in each jigsaw group to pick one model from their group to share with the class. Pair students with sympathetic partners that know their L1 so they can use their L1 during conversations. Have them focus on explaining one support, whether it be bar models or number lines, so they can focus on explaining their equivalent fractions with the new vocabulary for only one visual aid. Then have them transition to more new vocabulary with the second visual aid. Group students into mixed-ability groups with sympathetic partners that are willing to explain their process and assist in vocabulary word retention. 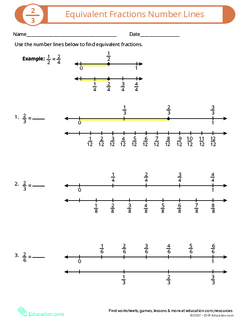 Provide additional practice with pre-drawn number lines or bar models. Have students draw multiple models and/or number lines showing several equivalent fractions (i.e., 1/3, 2/6, 3/9, and 4/12). Give two fractions that are not equivalent and ask students if they are equivalent. Have students justify their answer with a bar model or number line (i.e., "Is 3/5 equivalent to 8/10?"). Then, ask students to identify an equivalent fraction on their number line or model (i.e., "What fraction on your number line is equivalent to 8/10?"). Ask students to name other pairs of equivalent fractions and record their responses on the board or on a chart. Have students verify their answer on an equivalency chart and explain their answers orally in their L1 or L2. Provide sentence frames and a word bank for their explanations: "These fractions are/are not equivalent because ____." Allow students to share their answers in partners before sharing them with the class. Provide a sentence frame for when they share their equivalent fraction: "I think equivalent fractions are ____." Show the Equivalent Fractions video to review the concept of equivalent fractions (see link in related media). Ask & Discuss: Why might it be helpful to draw equivalent fractions? Allow students to share their explanations with their partners before sharing with the whole class. Give them paper so they can draw their equivalent fractions to assist in their explanations. Provide an outline of the video with visuals for them to follow as they watch it. Ask students to share in partners before sharing aloud with the group. Have them restate a student's explanation and then add to it. Use this resource to teach your students to simplify fractions by finding the greatest common factor between unlike fractions. Fractions and Greatest Common Factors will help students practice this key fifth grade skill. Try our free exercises to build knowledge and confidence. When fractions have big numerators and denominators, it can be tough to find the simplest form. Fear not!